Whether you find solitude in a quiet and secluded retreat setting, on a park bench in the midst of a bustling city, seated in a 747 at 30,000 feet, or while pausing at your kitchen window, the call of solitude is a gentle but insistent tug on our hearts. We long, in these moments, to go deeper with God. We pause to wait on Him in silence. But sometimes we'd like a wise guide who can help us with this practice. In his honest, original, and winning way, beloved author and retreat leader Brennan Manning shares his wisdom, stories, and heart from his own experiences in solitude. Brennan's meditations will prompt your own pursuit of God in the quiet places of your life. Souvenirs of Solitude includes an eight-day retreat guide that provides stimulating promptings for your own meditation during solitude. Whether you use all eight or only an entry or two, you'll find these exercises a refreshing breather from everyday concerns. 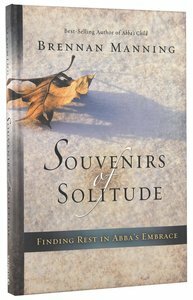 About "Souvenirs of Solitude: Finding Rest in Abba's Embrace"
Brennan Manning has spent the past 40 years helping others experience the reality of God's love and grace. It's at the heart of everything he's written and done. A recovering alcoholic and former Franciscan priest, his spiritual journey has taken him down a variety of paths. He has taught seminarians, spoken to packed arenas, lived in a cave and labored with the poor in Spain, and ministered to shrimpers in Alabama. He currently resides in New Orleans, Louisiana. Brennan is best known as the author of the contemporary classics The Ragamuffin Gospel; Abba's Child; Ruthless Trust, and The Importance of Being Foolish. Most recently he has produced Patched Together and The Furious Longing of God.